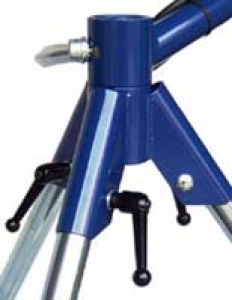 Featuring heavy duty steel levers, the BATA Quick-Release Leg Lock Kit allows you to quickly attach or remove pitching machine legs. No wrench is needed; just twist up or down and conveniently loading or unloading your pitching machine into or out of your vehicle becomes a breeze! The BATA Quick-Release Leg Lock Kit works with any BATA pitching machine and SHIPS FREE when purchased in conjunction with a pitching machine. No matter where you order a BATA Quick-Release Leg Lock Kit from, NOBODY actually stocks them; they all ship directly from the manufacturer's warehouse located in Redmond, Washington. Therefore, the shipping time frame is exactly the same no matter what website you order from (we hope that it is this one!). BATA Quick-Release Leg Lock Kits typically take 5-7 business days to ship from the time you place your order. They ship via FedEx Ground and could take anywhere from a day or two to a week to get to you AFTER being shipped, depending on your proximity to their warehouse. We will notify you of your tracking number the moment we receive it from the manufacturer's warehouse.